No matter how many bathrooms you have, they tend to be busy. And if they are not cleaned regularly, lots of dust and soap scrum are accumulated there. If you want to keep your bathroom clean, it is recommended to do small cleanings every day. Wipe the surfaces down using special cleaners every day, and you won’t have to spend a whole cleaning your dirty bathroom on weekends. If you want to give your bathroom a deeper cleaning, use scrubs and powders. Don’t forget that you can use eco-friendly cleaners at home and reduce the risk of allergy development. 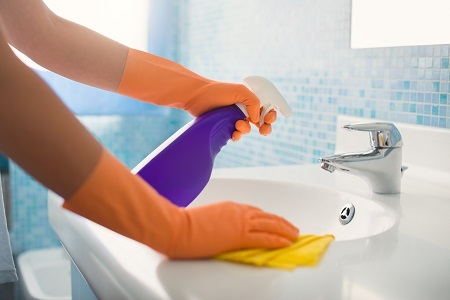 Vinegar and baking soda are perfect helpers in cleaning your bathroom. Sugar soap will help you to get rid of soap scum. Just spray it, rinse well and dry the surface with a paper towel. The dirt scrum on glass shower doors may be easily cleaned with a half of a lemon. Cut a lemon on half and rub a glass door with it. Rinse well. After cleaning your toilet bowl, experts recommend to add several drops of peppermint essential oil. It will add nice smell, but what is more important, it will coat your toilet with a film that will keep your toilet clean for longer. As we have already mentioned, vinegar is perfect for cleaning surfaces in the bathroom. It perfectly works almost on every surface. If you have a clogged shower, we recommend pouring bleach into the drain; leave it there for an hour, and then turn on the water and letting it go. Do you like foggy mirrors? We don’t. In order to prevent the foggy effect, use usual liquid soap. Rub it and then buff thoroughly. Baby wipes are perfect for delicate surfaces. They won’t damage them, but leave the surfaces shiny and sparkling. Mold can be easily cleaned with the help of white vinegar.